I’m pretty excited to share these velvet pumpkins with you today. I have been in love with velvet pumpkins for several years. They are gorgeous and can be used over and over again. This post is sponsored by LoveFeastShop. I love the luscious colors of the pumpkins. 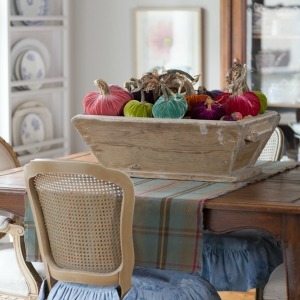 I’ve used a variety of fall decor over the years, and velvet pumpkins are one of my very favorite fall decor choices. I also like to use real pumpkins and real apples and pears. Of course the real pumpkins, apples and pears only last for a few weeks, while the velvet pumpkins can last for years. The pumpkins come in lots of different colors, and I love that I am not stuck with only using orange and brown. I love a lot of bright colors and love how the pumpkins feel like fall, but they also feel happy and cheerful at the same time. LoveFeast Shop is offering a 15% discount good through October 2018. Use promo code: 18YG15. Good for US only mailing addresses. Below I displayed the velvet pumpkins in a wood dough bowl with some of my favorite vintage silver plate candlesticks. They come in different sizes and quite a variety of colors. Note the real pumpkin stems that are used. You can also get a pumpkin with a feathered collar. They are so sweet. This is a lot of detail and must be a pretty involved process to make. And now to my very large wood trough that I got at Round Top. 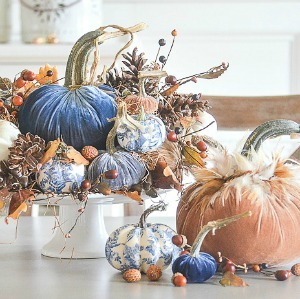 This is so rustic, yet so perfect for displaying my pumpkins. I set the trough on top of my Ralph Lauren tartan table runner. 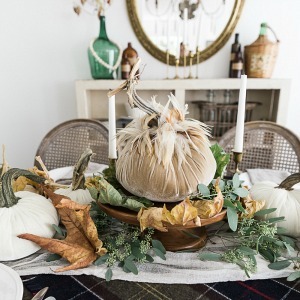 You could easily just set out velvet pumpkins and a few bowls of pears and be done with your fall decorating. I may not do much more myself. 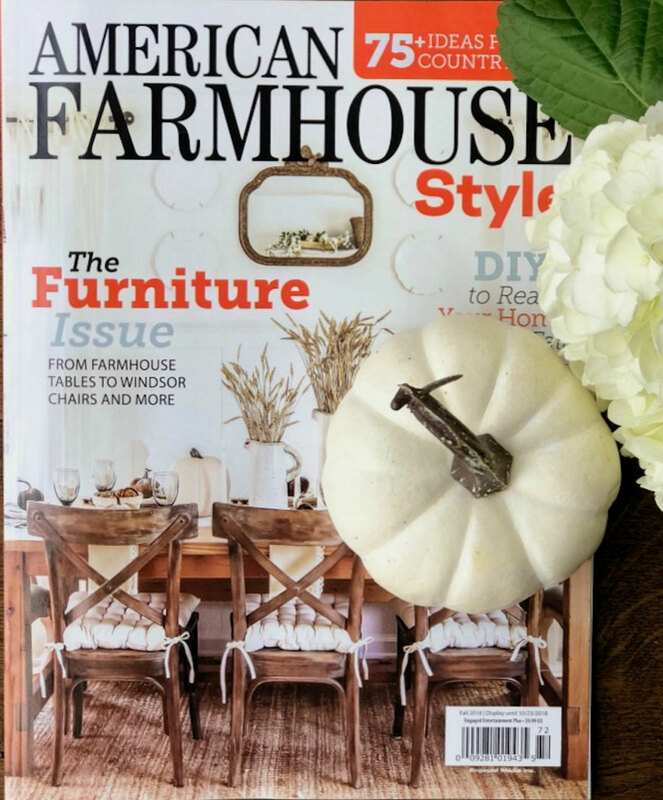 Be sure to check out the current issue of AMERICAN FARMHOUSE STYLE. 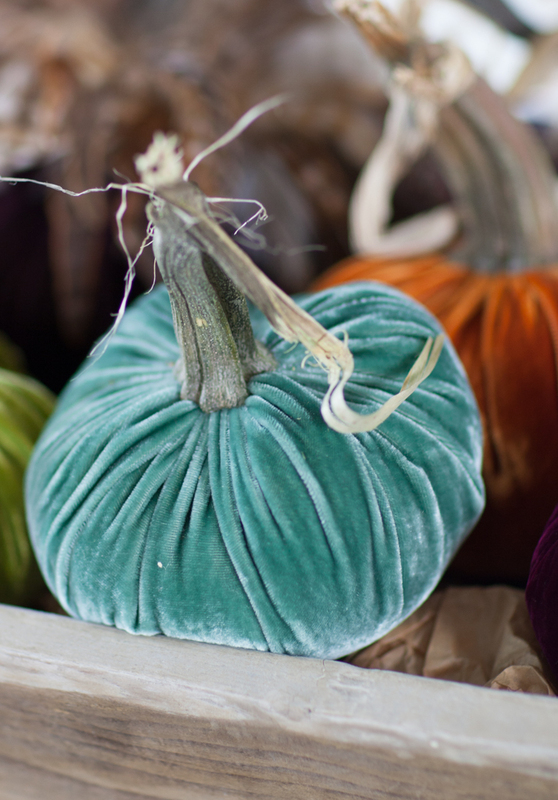 Please take a look at all the beautiful velvet pumpkin inspiration below. Such a cute DIY ! With the feathers it looks even cutter ! Good morning. I really enjoyed your post. 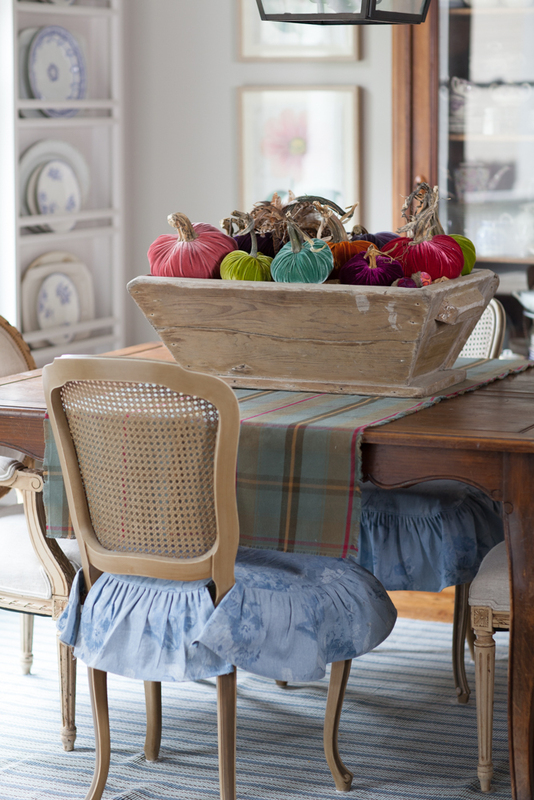 Can you tell me where you got the toile blue pumpkins? I have quite a few pumpkins and have never seen one like that. Thanks so much for the help. Janine, those belong to Yvonne of Stone Gable. Just click on her link and it will take you to her blog. I think she said she would do a tutorial on them tomorrow. I love all the pretty colors you have, Anita, and well well it works with your plaid runner!! So lovely! I absolutely adore velvet pumpkins. I’ve loved them for several years now. They’re just gorgeous. Such a pretty composition of rustic and elegant. Love it! I love the assortment of colors! 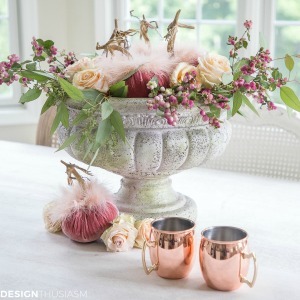 Anita, you have such a talent for mixing luxury with rustic! 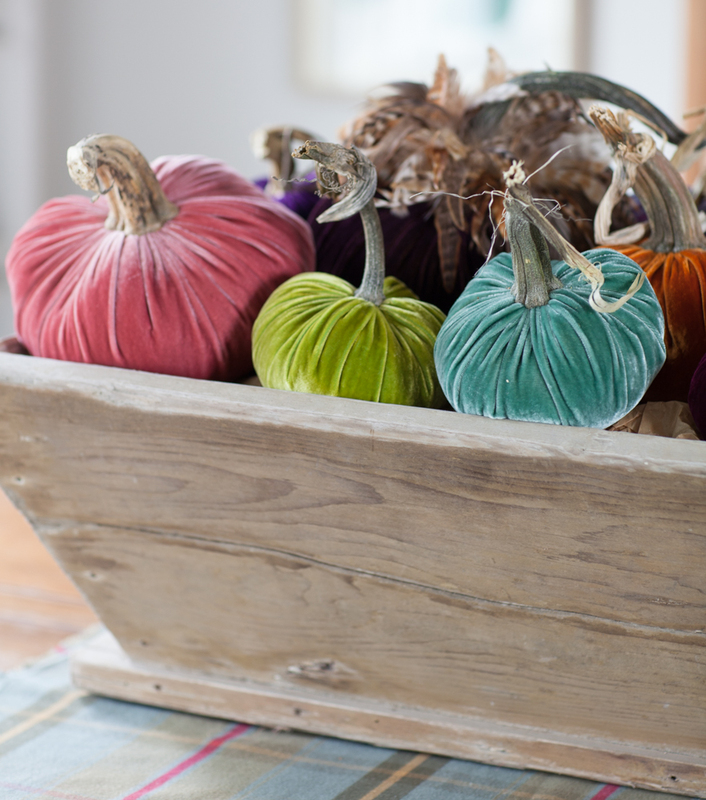 And you did it again, Your dough bowl is the perfect vessel for these gorgeous colorful pumpkins. So pretty! Thanks Yvonne. It’s easy to create beautiful photos with such gorgeous products. I love all the colourful velvet pumpkins you picked, Anita! Just gorgeous! The pumpkins and the dough bowl are beautiful! I look forward to stopping by your booth at Round Top. I’ll be there Friday, Sept. 28 through that Sunday…and I can’t wait! My hubby and I went last year and had SO much fun. Well, I had a blast and he was the great husband that carried packages, large windows, and various other items. Hope to see you then. Oh that will be fabulous Lea Ann! I should be there those days!!! So exciting, and what a great husband! I have followed LOVE Feast Shop on all social media platforms for a few years, Subscriber too. 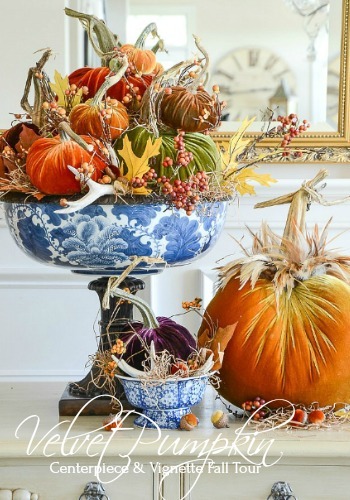 LOVE all the beautiful luxurious pumpkins and acorns too. MY most recent drool and on my wish list is her whisper bed skirt. So romatic and dreamy. Sigh! 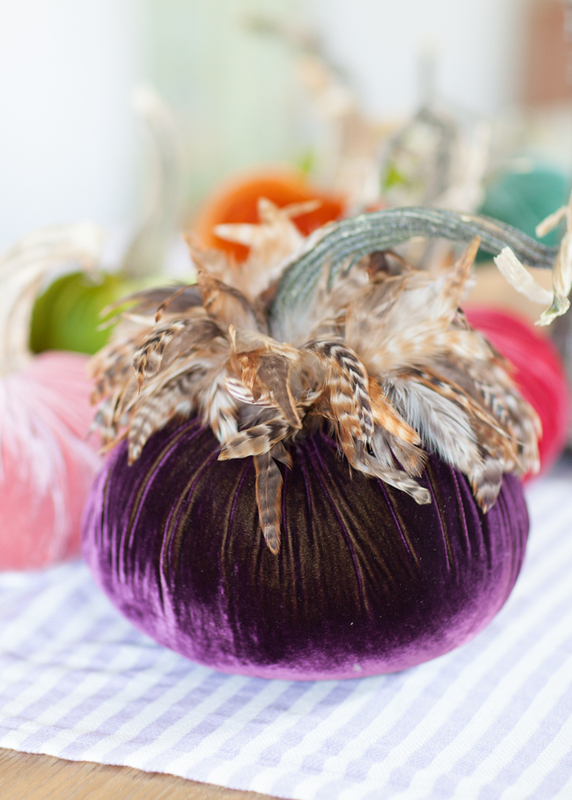 I am in love with these velvet pumpkins! I too am looking forward to Round Top and hope to see you on Sunday, September 23rd. We were able to get a room in LeGrande. Jackie, I should be there on the 23rd. So excited to see you. How exciting! Will Kelly be there as well? Kelly will be there Sat Sept 22 through the morning of Tuesday Sept 25th. What a opportunity, I am over the moon with the beautiful feathers! I know I need a few of them. please enter me into the drawing. Love these! Especially the ones with the feathers! FOR sure pumpkins and acorns too. But today I found a light I like. The planetary light globe. Charming. I love all the colors! 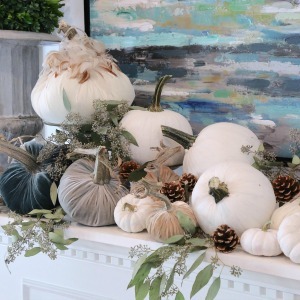 How nice that there are so many options to decorate for fall! These are gorgeous! I love the ones with feathers on top! Sharing! Thank you for sharing on Merry Monday! Hope to see ya next week! Such a stunning post Anita! 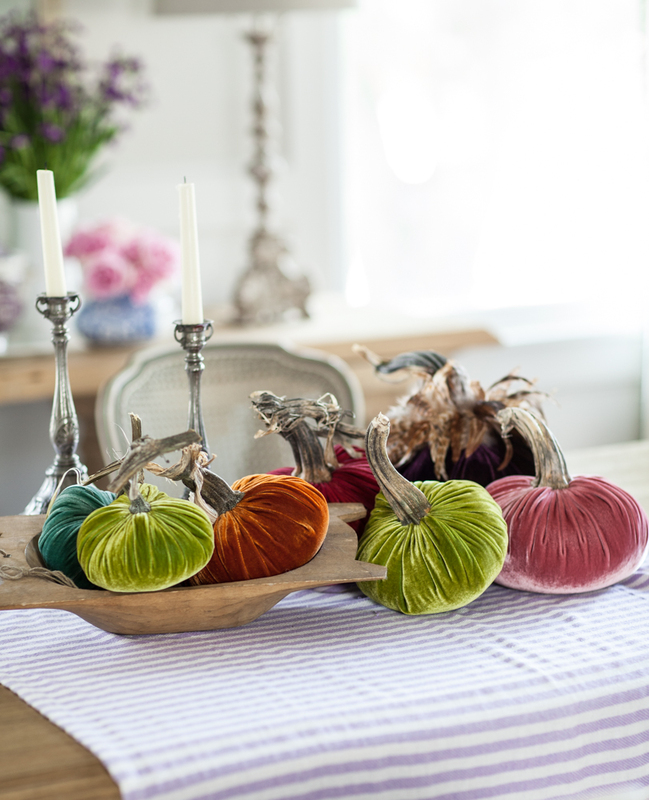 Your colorful velvet pumpkins are pure fall perfection. I would be honored if you would link up over at Thursday Favorite Things!